My first trip to 10 Manchester Street last night, loved the place. 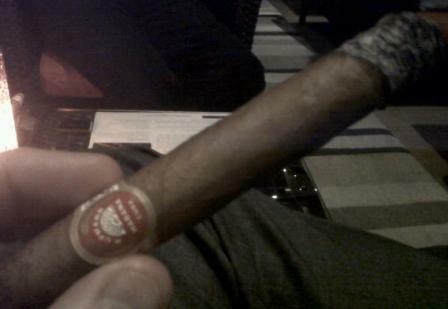 Also a first chance to try a rather glaring ommission from my cigar smoking history – the H.Upmann No2. Really enjoyed the smoke. It was well constructed and mellow, having not eaten it was a wise choice. It reminded me of the profile of a Hoyo more than anything, it built a little towards the end but had a lovely aged feel to it. I wish I knew what the box code was. I think I’ll buy a box at some stage as it is a good change of pace from my beloved Partagas.